It's funny that it took a 25 minute anime feature to say it this well but this is one of the best war time love stories that I have so far seen. From start to finish, this tale will keep you enraptured with it's compelling storyline and a type of animation style that I had not encountered before. The story is of young Mikako and her boyfriend Noboru. Both are 15 years of age and war is raging in the heavens above as mankind has made its way to the stars and in doing so has encountered interstellar war. Mikako graduates and has to leave for the depths of space whilst Noboru is left behind. The only way they can communicate is by using mobile phones to text each other messages over the far spanning reaches of the galaxy. It's within this environment that the true tragedy of their love manifests itself as Mikako is hardly aging as her ship makes it's way further and further from Earth, whereas Noboru is getting older and older. The further the space between the lovers, the long it takes for the message to reach each recipient. By the end of the feature it is taking over eight years for a message to go one way and yet the two, still in love, are faithful and poor Noboru waits patiently, forgoing any real semblance of a life in order to stay faithful to his beloved. Whilst this title is presented in full screen 4:3, they have still taken advantage of the fact that this is a digital process to make a faultless transfer. The art used makes you pay attention to every part of the show and the expressions and surrounds demand attention. Some might argue that with a running time as short as this you could watch it nonetheless, but with as many shows to get through as I have, being hopelessly addicted to the format, it's easy to get distracted. 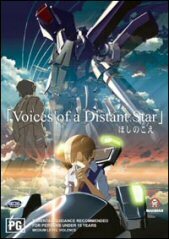 This is not the case with Voices of a Distant Star. Audio is a treat in 5.1 for both English and Japanese soundtracks. The English voicework was excellent although occasionally it seemed a bit stifled. Sound overall was crisp and clear and what we should be able to expect from all titles created in this day and age. Extras pack the rest of the disc with interviews, art and another short film called 'She and Her Cat'. Of course there are a number of trailers and the usual Madman propaganda titles that are always welcome to round out the mix. All things said and done, if you like anime then all I can suggest is that you must own this title. Anything less would make you a liar. It transcends the genre, time and space themselves and shows us the strongest thing in our lives is love.